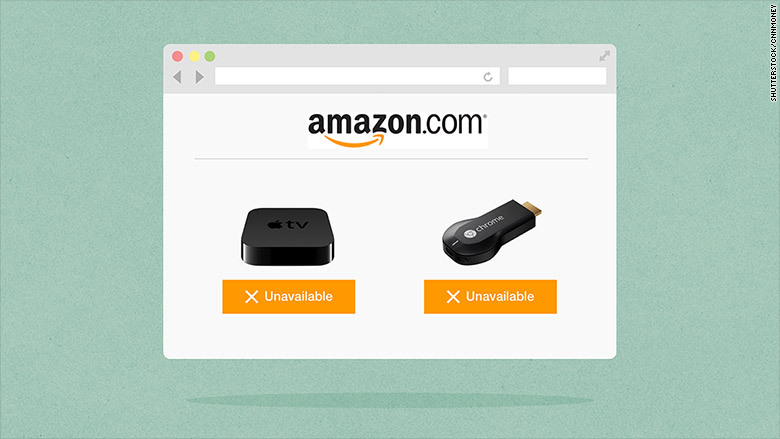 Amazon will ban sales of Apple TV and Google Chromecast on its platform. If you can't beat 'em, ban 'em. That seems to be Amazon's new strategy to get people to buy the company's streaming media products instead of its competitors'. Amazon will soon remove Apple TV and Google Chromecast streaming media devices from its online shopping platform. The company will also prohibit new listings for the products. Neither product allows customers to watch Amazon's Prime Instant Video streaming service. Technically, you can use a Chromecast to watch Prime videos, but you have to cast your screen from your phone or PC, and the experience is pretty aggravating. Amazon will continue to sell streaming media devices that compete with its Fire TV and Fire Stick, including the Roku, Microsoft Xbox and Sony PlayStation -- all of which allow customers to stream Prime videos. In an emailed statement, Amazon called all of those devices "excellent choices." "Over the last three years, Prime Video has become an important part of Prime," the statement says. "It's important that the streaming media players we sell interact well with Prime Video in order to avoid customer confusion." While Amazon's new plan is extremely aggressive, it's also shrewd. In addition to hardware, Amazon, Apple and Google are making big investments in streaming media itself. Google sells content and ads on YouTube, and Apple has Apple Music and iTunes. Meanwhile, Amazon (AMZN) has its own production wing, recently winning an Emmy for its critically acclaimed digital show "Transparent." By taking its competitors' products off its shelves, Amazon is cutting off a huge access point for consumers to buy Apple and Google's gadgets -- and their content. A Google (GOOGL) spokeswoman said the company didn't have a formal comment to share. Apple (AAPL) did not immediately respond to request for comment.